Would you like a built-in transmission cooler? New bolt-in aluminum crossflow radiators! The crossflow design has two 1-inch rows which offers better coolant flow and more cooling capacity than 4-core radiators. These radiators are available with a built-in automatic transmission cooler (select from the pull-down menu). These are fully welded (no epoxy, glue or gaskets). These come set up for AMC V8 equipped Jeeps. Note: we recommend the use of Teflon applied to the transmission cooler fittings, but DO NOT use Teflon Tape, as it can bind and ruin the aluminum threads of the cooler. You should use liquid Teflon Tape instead. Note: Stock Fan Shroud will not work with this radiator without modifications. Q: Does this have any kind of warranty on it? A: Everything we sell carries a 1 year warranty unless noted otherwise. 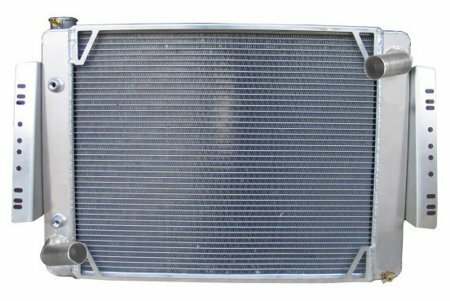 Q: Will this radiator fit a 1971, J4800, camper special, with a Buick 350 engine? The date of manufacture is 12/1970. A: No, but we have one specifically for the Buick 350 Applications that we will have listed by the end of the day today on our site. Q: Do you have a regular fan shroud for this radiator? A: We are working on a mechanical fan shroud for the aluminum radiators, which we hope to have released in the next month or two. Q: Will this radiator fit in a 6 cylinder j10 truck? Current has a 401 in it. A: The V8 radiators use the V8 core support, while the 6-cylinder radiators have a smaller core support that will not accept the V8 radiators. You'll have to change inner core supports to use the V8 style. Q: Is there a difference between the two transmission cooler ports? More specifically, when replacing a stock radiator, which port do I attach the previous right and left hoses (looking from the rear)? A: No, on the radiator they are simply in/out, and doesn't matter which one you use. Click here for a bolt-on electric fan and shroud kit! Made in USA with USA made cores!